Using data from NASA’s Lunar Reconnaissance Orbiter (LRO) spacecraft, scientists have created the highest resolution topographic map of the moon in existence. 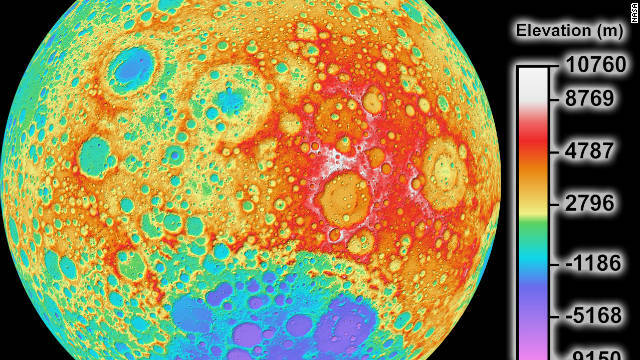 The map shows the surface shape and features over nearly the entire moon, according to researchers. It was composed from 69,000 stereo models from the Wide Angle Camera aboard the LRO. This map covers 98.2% of the lunar surface; persistent shadows near the poles prevent a complete stereo map at the highest latitudes, NASA said. But another instrument on the LRO, called the Lunar Orbiter Laser Altimeter (LOLA), is very good at mapping at the poles, and can be used to fill in the gaps. The colors on the map represent altitude. Because of the limitations of instruments on previous spacecraft, a global map of the moon’s topography at high resolution has not been possible until now. “Our new topographic view of the moon provides the data set that lunar scientists have waited for since the Apollo era,” according to a statement from Mark Robinson, principal investigator of the Lunar Reconnaissance Orbiter Camera at Arizona State University in Tempe. 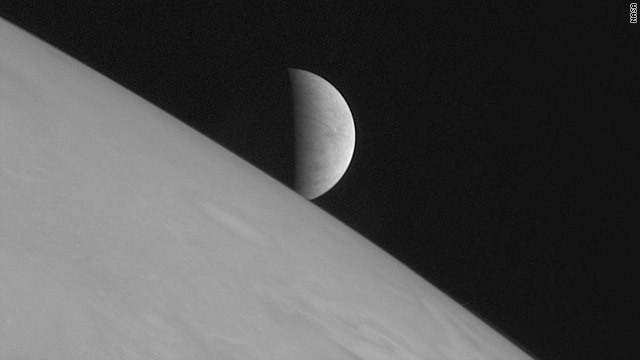 The New Horizons spacecraft took this image of Europa rising above Jupiter's clouds on February 28, 2007. Jupiter’s smallest Galilean moon, Europa, not only has a massive global ocean, it has huge lakes beneath its icy crust, according to new research. NASA has been very confident for about a decade that there is a huge ocean on Europa, according to NASA program scientist Curt Niebur. But the ocean is capped by an ice crust and no one was sure about its thickness. Europa is relatively large among the dozens of moons of Jupiter. Some scientists thought it was a mile or two thick, but most scientists thought it was several miles thick. A thick crust would be bad news for life because it would mean the ocean could never splash up on Europa’s shores to interact with possible sources of food needed to sustain life. New research announced Wednesday indicates the crust is thick, but it also shows that there are lakes above the oceans and that they are churning. This is key, because it means possible life forms in Europa’s oceans could make it the surface via the lakes to find food. "One opinion in the scientific community has been, 'If the ice shell is thick, that's bad for biology — that it might mean the surface isn't communicating with the underlying ocean,' " according to Britney Schmidt, a postdoctoral fellow at The University of Texas at Austin's Institute for Geophysics and the lead author of a new study published in the journal Nature. "Now we see evidence that even though the ice shell is thick, it can mix vigorously. That could make Europa and its ocean more habitable," she said in a statement. This is fantastic news for scientists hoping find signs of life on Europa, said Niebur. Scientists are basing their findings, in part, on what they learned from images taken by the old Galileo spacecraft, which was launched in 1989 to gather data and images from Jupiter and its moons. (It crashed into Jupiter in 2003). Those pictures show round bumps called chaos terrains. Based on the way ice moves around on Earth, the researchers developed a model to explain the bumps. The only way to confirm the model would be to fly a spacecraft to Europa to investigate. 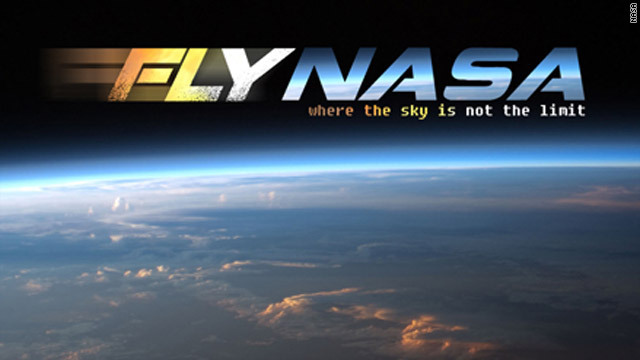 A mission is on the drawing board, but NASA hasn’t approved anything yet, according to Niebur. The Rosetta space probe took this picture of Lutetia in July 2010. The origin of the asteroid Lutetia may have been solved, scientists say, and the new information could help them understand how Earth was formed. Lutetia, a 62-mile-wide space rock resembling a giant dented potato, currently resides in the main asteroid belt between Mars and Jupiter. 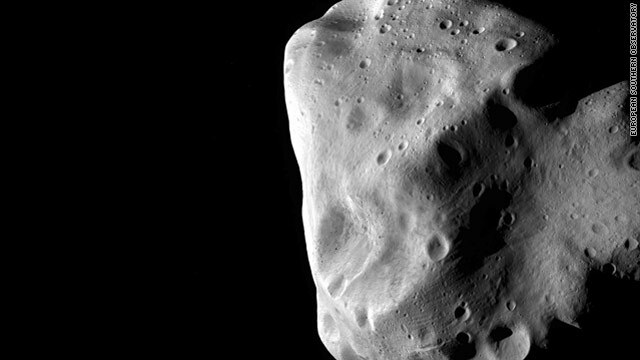 Scientists used to think objects found in the asteroid belt were born there, but Lutetia looks different. NASA is recruiting its next astronaut class, but the space agency warns the competition will be tough. Bolden told students in the audience for Tuesday’s briefing that they are the keys to NASA’s future. He also encouraged teachers to apply. 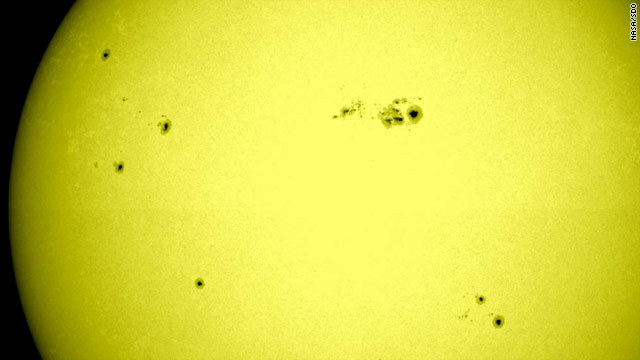 It’s bigger than the Earth and may be the largest sunspot in years. Solar scientists say a giant sunspot has rotated into view in the middle of the sun. It is surrounded by several smaller spots. The entire group is about 62,000 miles across. 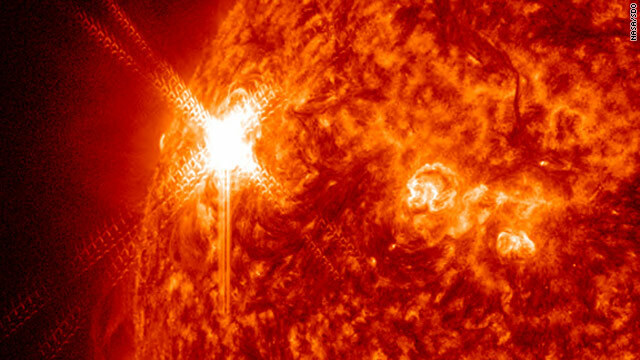 The sunspot group has blasted out several solar flares and is expected to stay active for awhile.